Sinn Féin Dublin City Councillor Christy Burke has slammed the partial destruction of a memorial to Dublin republican Seán Russell and a journalist in the Sunday Independent who congratulated the vandals responsible. 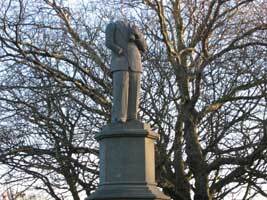 The attack on the statue of Russell, which saw the head removed, occurred in Dublin's Fairview Park over the Christmas period. Local people have been incensed at the desecration of this memorial to a figure of national importance who lived in the local area and whose relatives still live in Fairview. The attack follows a year-long campaign in the Sunday Independent aimed at discrediting the memory of Seán Russell and which was used as another excuse by that newspaper to attack Sinn Féin. The local Sinn Féin cumainn has had held regular commemoration ceremonies at the Russell memorial. Jim Cusack, who has led the Sunday Independent's campaign against Russell, was also the journalist who published a statement on 2 January purporting to come from an unnamed group claiming that they had carried out the attack over Christmas and accused Russell of being a "Nazi collaborator". Veteran of the 1916 Rising and former IRA Chief of Staff during the early 1940s, Seán Russell has long been a figure of controversy within Irish republicanism for a number of reasons. These included his decision to launch an armed campaign in Britain during the Second World War and his attempt to acquire arms from Germany. However, Russell was not a fascist, nor did the IRA of that time support the Nazi regime. Indeed, under Russell's direction, the IRA was in contact with numerous foreign agencies, including the Soviet Union and IRA supporters in the USA, for the purpose of acquiring arms. Commenting on the attack, Councillor Christy Burke said: "Many local people have been angered at the destruction caused to Russell's memorial by outsiders. They came into this area in the dead of night disturbing the peace of the Christmas period to desecrate a memorial to a local man whose family still live in the area and whose memory is respected. I do not believe that this attack was carried out by any genuine anti-fascist group as claimed by the Sunday Independent. I note that Sunday Independent columnist Ruth Dudley Edwards has congratulated those who carried out the vandalism in Fairview. This follows her newspaper's campaign against Russell and criticisms of local Sinn Féin commemorations. The hypocrisy of her remarks in encouraging the destruction of national monuments should be seen in the light of her newspaper's vehement opposition to direct political action of any kind when it doesn't fit with that paper's political agenda." Councillor Burke has offered his support to the campaign being undertaken by the National Graves Association to restore the monument to this Irish patriot.